I think a lot about the idea of transmedia these days. I think beyond a console game into an action movie or a comic book into a Facebook game and how they link together. The other night, for instance, I walked the somewhat spooky halls of the Whitney Museum. Nintendo had closed the fifth floor for an event that heralded the release of a DS offering, Art Academy. It’s far more of an app than a game. But after a few short lessons, I swear I could draw better than I ever had before. Not much better. But better than my usual stick figures. 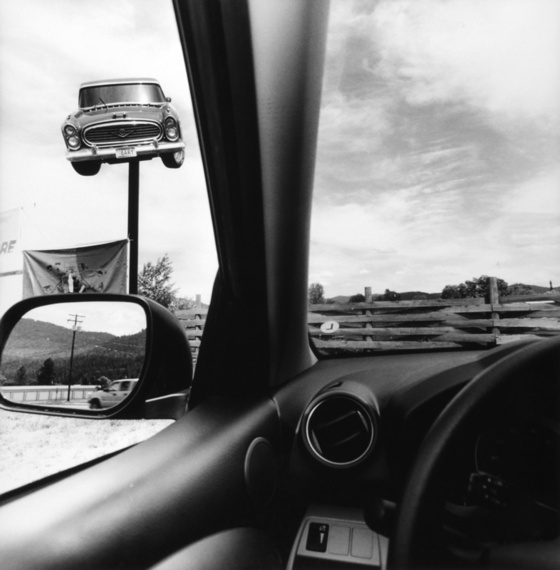 Around 8:30 p.m., I found myself exploring the two rooms that housed the moving photography exhibit, Lee Friedlander, America by Car. It is an odd, tantalizing, heart-tugging exhibition. All photographed from the driver’s seat of a car, the photos can be at once convivial and lonely, communal and haunting. It is the American dream, Friedlander-style. If it weren’t for the guard eyeing me suspiciously, I would have taken a photograph of the photograph with my DS. Then, I would have tried to make it mine by drawing a version of it with Art Academy. That’s truly transmedia, a more recent, but equally compelling, American dream. ← Do You Want to Join Us?